The card creates a magnetic field, so virtually any credit card terminal can read it, no NFC required. The world's biggest maker of Android phones launched a major challenge to Google Wallet on Sunday: it's going to start a rival phone-based payment system beginning in the U.S. in the coming months. 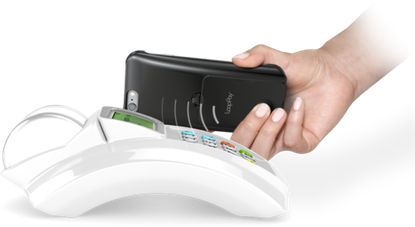 Samsung Pay will work first on the new Galaxy S6 and relies on the contactless NFC payment infrastructure also used by competitors -- but with the added advantage that it will also be able to communicate with traditional magnetic card payment terminals. The consolidating market for niche semiconductors shrank again this weekend as Dutch NXP announced that it is buying Freescale in a deal valued at US$11.8 billion, the New York Times reported. The combined company will play in mobile payments with NXP's near-field communications technology while Freescale's market range extends to the red-hot automotive electronics space, where it has counted Tesla as a customer. Iran is negotiating to allow Google and other foreign Internet companies to operate in the country, the official Islamic Republic News Agency reported on Sunday. Comments made by Nasrollah Jahangard, Iran's deputy minister of telecommunications and information technology, to local media indicate that talks are underway for Google to place servers in Iran, and that the government is also in discussions with several other large U.S. and European Internet companies. Smartphone enthusiasts finally saw some much-anticipated new models introduced ahead of the official opening of Mobile World Congress in Barcelona on Sunday. Bringing their latest offerings to market were Samsung with the Galaxy S6, HTC with the One M9, Microsoft's latest Lumia and LG with Magna. MWC is also increasingly about wearables, as the market fills with Android smartwatches angling for position before Apple breaks things open when its watch hits stores in the next month or so. We saw interesting introductions from Huawei, HTC and LG. Having just succeeded in pushing through net-neutrality rules in the U.S., Federal Communications Commission Chair Tom Wheeler may get a cool reception when he steps up to make a keynote address at the Mobile World Congress. It's the telcos' party and savvy marketers are already playing to the room: Nokia chief Rajeev Suri took a shot at the new rules at a press event on Sunday. Swedish budget furniture maven Ikea wants in on the mobile market, not with another phone or a smart watch, but by charging devices placed on or near its furniture. The company has selected the Wireless Power Consortium's Qi standard for wireless charging and will be shipping products to hit stores in the U.S. and Europe in April, according to reports. The Obama administration Friday released a proposed privacy bill of rights for U.S. consumers, but it immediately came under fire from consumer advocates. Under the plan, U.S. businesses that collect personal data would be required to describe their privacy and security practices and give consumers control over their personal information. However, it would also let industry groups submit their own codes of conduct to the Federal Trade Commission and then shield companies that follow those codes from FTC enforcement actions; that provision is a non-starter for privacy advocates. She may not have the market power of Taylor Swift, whose decision to pull her music from streaming service Spotify caused shock waves in an industry where the online middlemen seem as inevitable as the pennies they pay to musicians. But quirky Icelander Björk -- who is as tech-savvy as they come, releasing an album in app form and a video for viewing with Oculus Rift -- has joined the pop superstar in also saying no to Spotify, Fast Company reports. If fingerprint-based authentication for mobile phone access is already feeling old hat, how about using a retinal scan like this ZTE phone? From IEEE Spectrum: Facebook AI Director Yann LeCun on His Quest to Unleash Deep Learning and Make Machines Smarter.